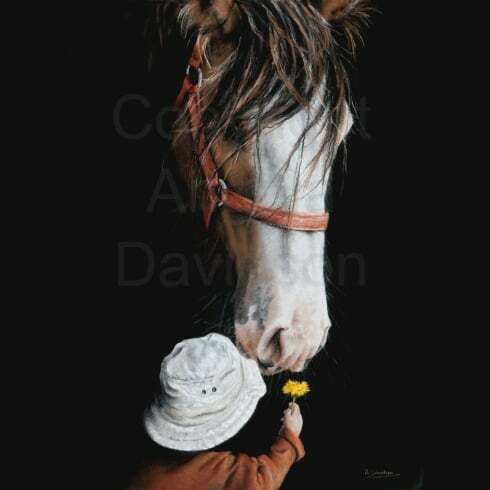 There are quite a few prints in Angie's collection which feature our son Lawrie, and this print of Dandelion is yet another instance of us 'exploiting' our child. The inspiration for Dandelion came when Angie and Lawrie visited Strathorn Stables, which is near our home. 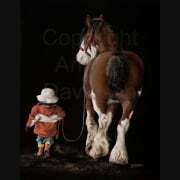 Angie was taking photos of a Strathorn Clydesdale when Lawrie appeared in the viewfinder of her camera. Her first instinct was to get Lawrie away from the huge horse, but she quickly realised there was something going on between them. The horse had lowered his head and stood perfectly still, allowing the tiny boy to stroke his muzzle – for what seemed like ages.